Strip, cut, twist, shear and crimp with one tool! Full length, induction hardened knives and a high-leverage design for more cutting power of hard wire. The wide, knurled head easily grabs and twists wires. 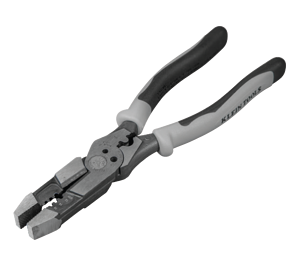 Convenient bolt shearing holes plus a crimper for non-insulated connectors, lugs and terminals make this a must-have tool for your bag.